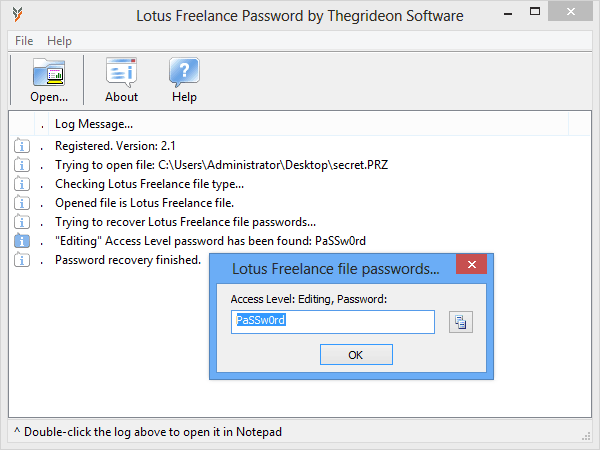 Lotus Freelance Password by Thegrideon Software allows you to recover "editor" passwords which Lotus Freelance files (*.prz) are locked with. All versions of Lotus Freelance are supported. You may also check other Lotus SmartSuite tools or our password recovery service. 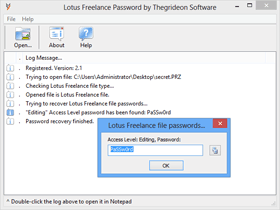 Lotus Freelance (*.prz) password recovery. All versions of Lotus Freelance are supported. Password recovery for any valid Freelance file is guaranteed - in the unlikely case of any issues we will remove or replace your file password for you. Trial version allows you to check file format and passwords recoverability. Recovered passwords are hidden behind the asterisks.